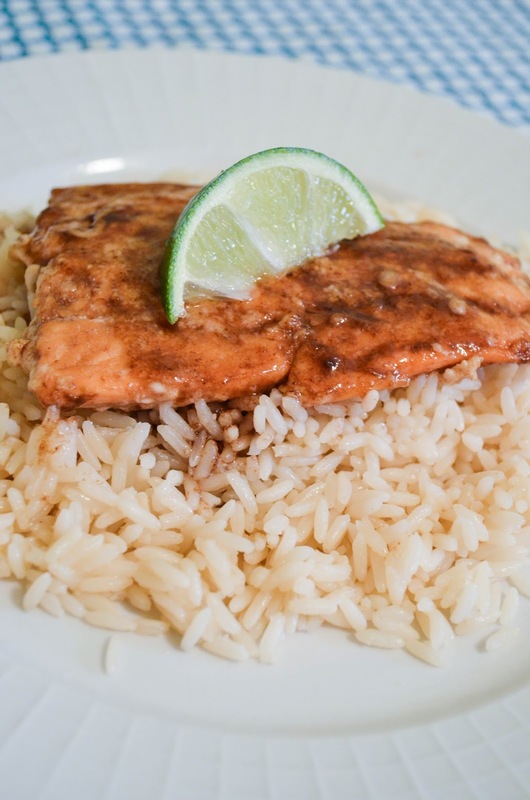 This salmon dish combines a tasteful tangy sweet flavor, somewhat indulgent! By now you probably realize I like honey… alot! Partially because I am blessed to get honey from my parents farm so I know it is fresh and somewhat local (Pennsylvania), but also because it’s a great sugar alternative. It’s all about the sauce. When trying to eat healthy your favorite sauces and marinades are one of the first things that get purged from the cabinets. It’s always hard for me to find sauces in the store that don’t contain bad things. If anyone recommends a certain brand, let me know! So finding a good recipe to make your own is priceless. The coconut oil adds a light tropical flavor that blends well with the lime. This can be substituted with other oil if needed. The glaze could also be used on chicken or pork if you wanted. To save money on this dish look for salmon in the freezer section or at my favorite store, Aldi as opposed to fresh from the seafood counter. Try to buy wild-caught, not farmed seafood whenever possible. In a medium saucepan add coconut oil and salmon fillets. Cook for 3-4 minutes on each side, until they start to crisp then add 1 Tbsp. balsamic glaze. Cook for approximately 5-7 more minutes. Depending on the thickness of your fillet, it may require longer cooking time. Remove from the pan and plate with rice (or other starch). Finish by topping with the rest of the glaze .